Growing up in Florida, we never really had a true "fall", the weather cooled down a little bit, but no changing leaf colors, autumn coats, & apple picking. So, in relocating to the Midwest it's definitely the season I've embraced the most! I like when the air starts turn to turn crisp & the leaves begin turning red and orange. So, what's on your fall bucket list this year? I obviously can't wait for pumpkin picking/decorating, and Thanksgiving baking and all of the fun that the season entails too! I'd love to take a mini-roadtrip once the leaves change colors. Fashion wise, I'm looking to invest in a colorful coat + comfy boots! It was cool this morning in Tally and it felt like fall! I'll miss you during the annual cider and donuts when it gets REALLY cold :) You have to do it in Wisconsin too! Carry on the tradition! Ahhhh I love this. May have to print it out and hang it up on my bulletin board :) I definitely want to go apple picking, bake an apple pie, and take a hike in the mountains when the leaves are changing colors! I seriously looove fall! I love bonfires. I'm getting more excited for the autumn now. love this!! It makes me want fall to be here now!! Moving to the midwest has made my fall/winter wardrobe much more exciting! I can't wait to break out my sweaters! I can't wait to cook a whole bunch of things with pumpkin in them like pumpkin pancakes! hmmm bucket list for fall? apple picking, tailgating, and bonfires too! so with you there! A bold well-tailored coat is definitely a fall must! Love that red! Oh my gosh, what part of Florida did you grow up in, and where in the midwest are you now? I grew up in Florida also, in Daytona Beach, and now I'm in Minnesota while my husband is in law school. Too funny! We'll be moving back to Florida when my hubs finishes school, so I'm soaking up as much Fall (and just seasons in general) as I can while we're here! I always wanted to experience a real Fall; last year was our first one here and it definitely didn't disappoint! I'm wanting to go apple picking as well, and I'd love to take my kids to an actual "pumpkin patch" instead of picking out our pumpkins from the grocery store. I am in Texas so we really don't get much of a fall. It kinda makes me sad because it'd nice for like 3 weeks and then it turns to winter. I want to pick apples and learn to can too! 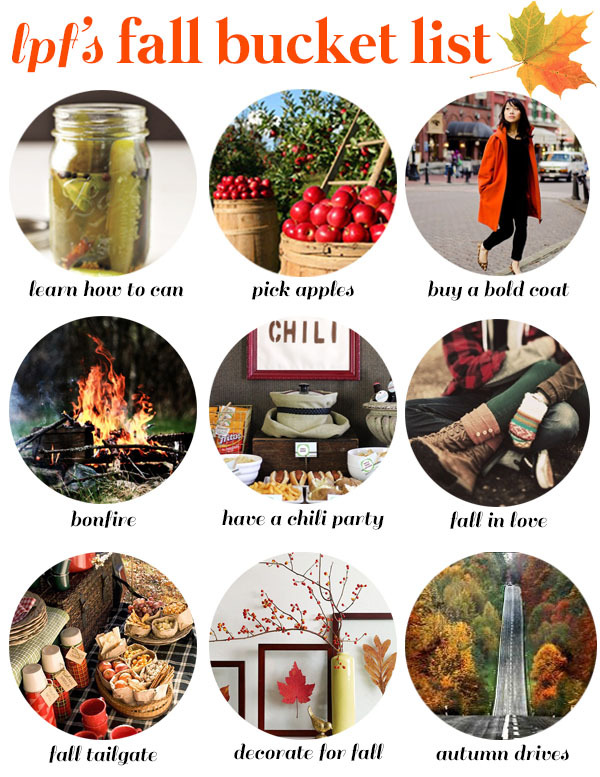 This board hit the nail on the head for all things that make us giddy for fall! I definitely want a bold coat!! I'm so excited for all the fall food like pumpkin muffins. ahhh can't wait! I love fall, and I love this post! I am going to make B sit down with me tonight to make a fall bucket list. Picking apples will definitely be on it! Yes to pretty much all of those things! I love fall and I'm determined to enjoy every minute of it this year!